This leading maker of nutritional supplements happily said yes when the Business Council for Peace (Bpeace) asked if they would share their knowledge with two ambitious Salvadoran entrepreneurs focused on growing their vitamin manufacturing business in one of the poorest countries in the Western Hemisphere. Teresa Orth, Senior Vice President of Human Resources at Vitamin Shoppe, discussed the knowledge-sharing significance. What is Vitamin Shoppe's claim to fame? For the goal-orientated wellness customer, The Vitamin Shoppe® is your ‘best self” destination that helps you thrive every day, with inspiring experiences and nourishing solutions that take you from simply living, to thriving. How did The Vitamin Shoppe become a Host Company for Bpeace entrepreneurs, known as Fast Runners? 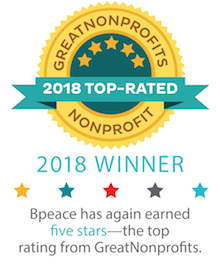 Kate Buggeln, who is on the Bpeace Board and had been a Vitamin Shoppe Board Director, introduced us in 2014 and asked us to be a Host Company. We had such a great experience that when we were approached about hosting Laboratorios SYM this year, we didn’t hesitate. We appreciate the underlying mission of helping entrepreneurs from economically challenged countries, particularly those who sell products that deliver health and wellness to their communities. How does being a Bpeace Host Company fit into The Vitamin Shoppe ethos? We have talented people here and a purpose-driven brand so it feels like we have a responsibility, when appropriate, to share our knowledge with others. Tell us about the Bpeace Fast Runners who came to visit from El Salvador. What was their business and what problem or opportunity did you address? Two brothers, Josué and Oscar García Novoa, from Laboratorios SYM visited with us. They had the opportunity to grow their family business quickly so they were particularly interested in supply chain complexity. In particular, they wanted to learn about ways to improve their process, from the equipment to the layout of the facility to packaging. They also wanted to learn how we approach the customer experience. What did The Vitamin Shoppe do as a Host Company? 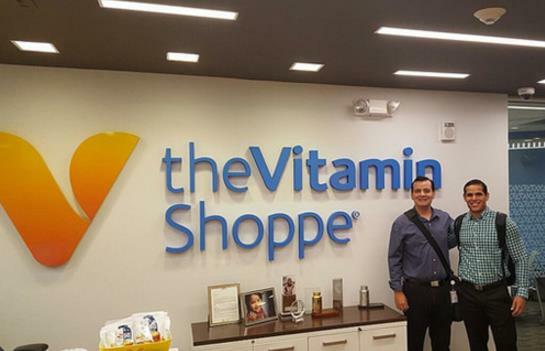 Josué and Oscar visited The Vitamin Shoppe’s Secaucus office for two days. During their visit, they actively connected with members of our Senior Leadership Team, discussing processes of the company, best practices, and answered any questions that Bpeace had. They had the opportunity to go our Distribution Center in North Bergen to see the inner workings of the Supply Chain and also went to our Brand Defining Store in East Rutherford to see the latest layout and elements that we’re incorporating into our stores. Our team was really engaged and excited to mentor Josué and Oscar and honored at having the opportunity to share their knowledge. What impressed you about the Fast Runners? Josué and Oscar had a desire to learn and were well prepared and receptive. They asked great questions and were excited to find out about other retailers as well. They also conveyed a strong sense of responsibility they feel toward their family business, and we highly respected that. Did you have any apprehensions about making the Host Company commitment? No, not at all. We had such a favorable experience the first time around that we were happy to do it again. Were there any unexpected outcomes of the experience? The feedback was that the experience met the Fast Runners’ expectations. What are the benefits of cross-cultural exchanges between businesses? The Vitamin Shoppe team was glad to see that there was a real appreciation for nutritional supplements on a global level. Was there any follow-up after the meeting? They were kind enough to send us a thank you along with some pictures, which we shared on social media. What would you tell a firm hesitating about being a Host Company? I would encourage people to pay it forward. When you give back and a business prospers, everybody wins. The Vitamin Shoppe is a publicly traded company with over 700 stores throughout the United States and Puerto Rico. To learn how you and your company can help businesses in challenged economies flourish, visit bpeace.org.